Apple launches Watch, new MacBook; drops Apple TV price | What Hi-Fi? Apple's Spring Forward event today saw the company release more details on the Apple Watch, including some eye-watering prices for the premium models, plus a new MacBook, and updates for Apple TV and CarPlay. As expected, Apple took the wraps off its new Apple Watch today. The Apple Watch will be available for pre-order from 10th April and released on 24th April in the UK, US and other countries. The Apple Watch comes in three models - the standard Watch, Watch Sport and the high-end Watch Edition - with starting prices ranging from $349 to $549 for the two cheaper models up to a wallet-busting $10,000 for the Watch Edition. Prices will vary according to the type of strap and the size of the screen, with two screen sizes available. The smartwatch has a built-in speaker and mic so can take voice calls, will be able to receive any notifications you can currently receive on your iPhone, and promises to come with "thousands" of apps. The Apple Watch will be able to control your iPhone's music, and no doubt soon come with plenty of system-controlling remote apps, as we've seen across the iPad, iPhone and other devices. 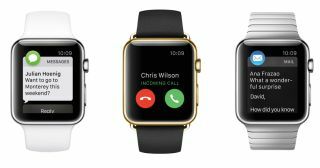 Apple claims the Watch has an 18-hour battery life (the iPhone 6 claims up to 15 hours). Apple also revealed the Apple TV will be the exclusive launch partner for the new HBO Now streaming TV service in the US, bringing the likes of Game of Thrones to Apple TV in the US. The entry price for Apple TV has also been cut from $99 to $69, or around £45. There was also a new MacBook, sporting a 12in, 2304 x 1440 resolution screen. It weighs just 920g and is 13.1mm slim. It will have just two connections: one main USB-C port for power, video and USB, plus a headphone jack for audio. It will cost $899. There was also news on CarPlay, with Apple revealing it's now supported by "every car maker" and is set to appear on 40 new car models. Apple also revealed it has now sold 700 million iPhones to date.